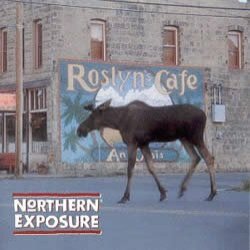 ... the only Fanlistings Network and TV Listings approved fanlisting for the TV show Northern Exposure. The story starts with a doctor from New York who has just graduated from medical school. His tuition was paid by the state of Alaska and he thinks he is on his way to paying back his debt by working a few years in Anchorage. However, unbeknownst to him, instead he is earmarked for service in the tiny, quirky village of Cecily, which is on the corner of No and Where, and populated by locals who include a Native American shaman in training, an ex-NASA astronaut, a bush pilot, a May-December couple, and a DJ who routinely quotes existentialist philosophy at the crack of dawn. How soon until his head explodes? Northern Exposure ran for six seasons, won many awards including two Golden Globes and was nominated for dozens more, and is widely believed to contain some of the best screen writing ever. Here's a sample quote, from Chris, the local DJ: "There's a dark side to each and every human soul. We wish we were Obi-Wan Kenobi, and for the most part we are, but there's a little Darth Vader in all of us. Thing is, this ain't no either-or proposition. We're talking about dialectics, the good and the bad merging into us. You can run but you can't hide. My experience? Face the darkness. Stare it down. Own it. As brother Nietzsche said, being human is a complicated gig. So give that ol' dark night of the soul a hug. Howl the eternal yes!" For more information, see the about page. This fanlisting is listed with the Fanlistings Network, the web's largest directory of fanlistings, and is maintained by Tehomet since June 2006. Please navigate the site using the menu above, and if you like, join the fanlisting!